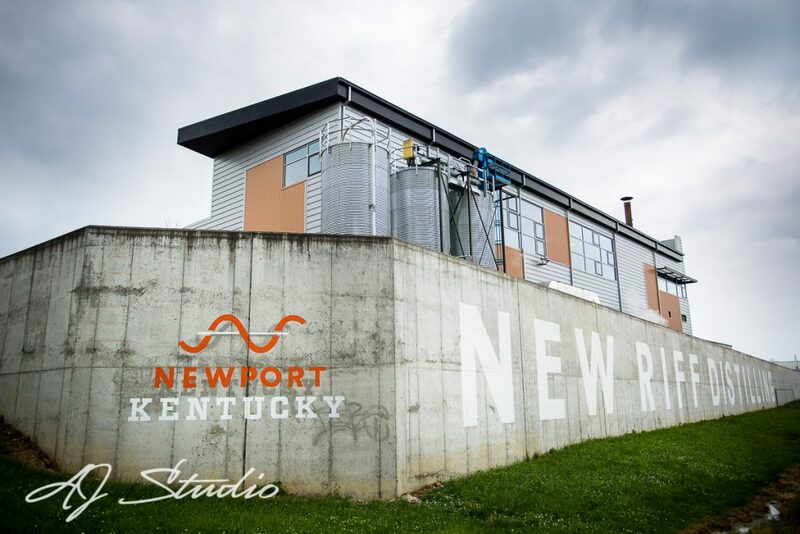 New Riff Distilling is the most northern stop of the Kentucky Bourbon Trail Craft Tour but also an excellent venue to consider when looking to plan your wedding. We were there last month and were impressed with this modern and fun wedding venue. The Tower Room’s wall of windows offers amazing views of Cincinnati and the Ohio River and has an outdoor space that runs the length of the building. It is such a fun atmosphere! I loved meeting and working with Aly and was able to see first-hand how well they take care of their brides and grooms. Here’s some more information that Aly was able to pass on to us! Q – Tell me about your favorite client. A – All of my clients are my favorite clients! I couldn’t possibly just pick one. Q – How far out should a client pay a deposit to secure your services? A – This just depends on how far out the couple is looking. If they are looking a year or two in advance then they have some time when it comes to putting down the deposit but the closer the date gets the sooner I would recommend putting a deposit down. If you know the space is for you, I would go ahead and put a deposit down ASAP. We book quickly and you don’t want to take your chances when it comes to your dream venue. Q – What is included when a client books your services? A – Your room rental will include: free parking, dishware, glassware, flatware, AV equipment, linens, and furniture set-up. Your bar package will include: Bartenders, barware, soft drinks, alcohol, mixers, garnish, ice and black cocktail napkins. Q – What do you have planned for the future? A – We have big plans for the future! Our distillery is growing and our bourbon will be out summer 2018 and we hope to continue to put on successful events day in and day out. Q – What aspect of your job makes you most excited? A – I love being able to see the events come to life, especially weddings. And I also feel so lucky that I get to be a small part in making my clients special day one they will never forget. A – It’s YOUR day, don’t get too caught up in trying to please everyone else. Of course, keep your guests in mind but don’t forget this day is about you and your partner. Q – What makes New Riff unique? A – First off, the not-so-obvious answer to this question: I think the New Riff team makes us stand out. Whether we are making bourbon or putting on events we believe that nothing of quality comes quickly and nothing of substance comes easily. Our team truly puts in our ‘all’ to make your experience unforgettable. Now, for the obvious answer: Our building. We have an amazing and incredibly unique event space. With our rare four-sided bar, stunning modern furniture, outdoor terrace and walls of windows offering amazing views of downtown Cincinnati and the Ohio River this space is like nothing you’ve ever seen before. Click here to learn more about New Riff Distilling. This entry was posted in Wedding venues and tagged Cincinnati Wedding Photographers, Kentucky Wedding Venues, New Riff Distilling.